This view of the Orion nebula highlights fledgling stars hidden in the gas and clouds. It shows infrared observations taken by NASA's Spitzer Space Telescope and the European Space Agency's Herschel mission, in which NASA plays an important role. 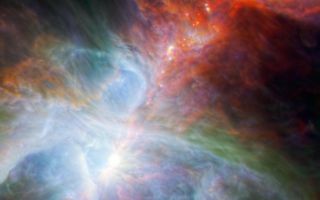 This stunning space wallpaper shows a view of the Orion nebula that highlights fledgling stars hidden in the gas and clouds. It shows infrared observations taken by NASA's Spitzer Space Telescope and the European Space Agency's Herschel mission, in which NASA plays an important role. A star forms as a clump of this gas and dust collapses, creating a warm glob of material fed by an encircling disk. These dusty envelopes glow brightest at longer wavelengths, appearing as red dots in this image. In several hundred thousand years, some of the forming stars will accrete enough material to trigger nuclear fusion at their cores and then blaze into stardom.